In this room,artisans are coloring Yuzen. She is coloring the seeds of ivy. This is a cloth-convey system so that they can work smoothly. She is coloring buds of Japanese apricot. This design is a combination of Japanese chrysanthemum,Japanese apricot,and fan. This man is also painting. He gives the cherry blossom a few finishing touches. The closest attention is needed to draw fine line. The cherry blossoms are described vividly. This is a reference room.This room is like small library. They refer to these books for drawing designs for a kimono. These books are about ancient Japanese pictures. These books are very expensive. For example,they refer to this kind of ancient picture. 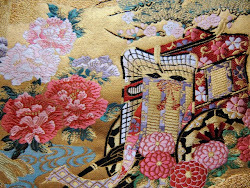 Yuzen kimono is created through long long processes. It takes at least 2 months to create Yuzen kimono. It is the product after their strenuous efforts. I admire yuzen works so much!!! !